"Tropical Resort" redirects here. For the DS version of the stage, see Tropical Resort (DS). For the Sonic Generations 3DS version, see Tropical Resort (Sonic Generations 3DS). 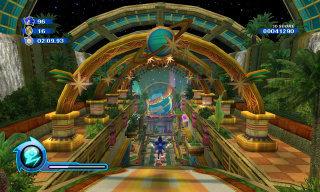 Tropical Resort is the first stage of Sonic Colours for the Wii. A glitzy orbital hotel precinct for Dr. Eggman's Amazing Interstellar Amusement Park, the area is full of flashy neon billboards, firework displays, and faux-jungle plant arrangements. The stage was one of the two first levels of Sonic Colours (the other being Sweet Mountain) to be revealed. It appears on the game's box art and serves as the introductory stage of the game. Most of the Egg Pawns in the level are waving signs, "welcoming" Sonic to the park, and try to attack him with their signs. The analogue stage in the DS version of the game is Tropical Resort (DS). Tropical Resort is the central worldlet of Dr. Eggman's new theme park, to which all the captured planetoids are tethered with giant chains (reminiscent of the technique the Doctor developed long ago in capturing the Miracle Planet). The space elevator from Sonic's world deposits travelers here, which is how Sonic and Tails make their way up after Eggman haphazardly left the keys inside. After doing some exploring, Sonic catches a glimpse of Orbot and Cubot trying to capture Yacker and a Cyan Wisp. While the blue hedgehog speeds all over the park smashing stuff, Tails concentrates on adding a new application to his Miles Electric device so he can translate the Wisps' language. Sonic finally runs into Eggman right at the end of the stage, interrupting the fat man's usual deranged gloating. The park's creator doesn't bother to stick around, instead directing Orbot and Cubot to sic the Rotatatron on Sonic. Before any opening cinematic or even asking for player data, the game throws you straight into Tropical Resort Act 1. This introduces the player to the basic controls of the game, such as jumping, grinding, the homing attack, and the Sonic Boost. Despite being an introductory stage, there are many areas in this act for the player to explore once he or she unlocks the Cyan and Yellow Wisps later in the game. Tropical Resort Act 2 is about the same size as the previous act, this time focusing primarily on 2D sections and introducing the player to slower platforming and objects such as fans that will propel Sonic in whatever direction they are facing. Much like Act 1, there are many areas to explore after unlocking more Wisps. Tropical Resort Act 3 introduces the player to the Quick Step. In the latter part of the act, there is an area full of boxes that Sonic can break through using the stomp attack. Tropical Resort Act 4 is a short 2D act. Despite its size, collecting all of the Red Star Rings in this act requires a bit of exploration, and two of them can only be reached by using the Purple Wisp, which isn't unlocked until much later in the game. Tropical Resort Act 5 makes use of the Cyan Wisp, focusing on diamonds that Sonic can ricochet from and targets that he can break to earn more points. Some of these targets are hidden beneath boxes that can only be reached using the Pink Wisp. Tropical Resort Act 6 is a short 2D act, similar to the previous two acts. This act introduces rotating platforms and platforms activated by switches. This page was last edited on 8 April 2018, at 09:47.